* Jazz St. Louis has posted to Facebook an album of photos from last Friday's National Donut Day celebration at their HQ in Grand Center. A panel of judges sampled donuts from 15 local shops and bakeries, and selected downtown's Pharoah's Donuts as the winner. * Pianist Simon Rowe, a native of Australia who lived in St. Louis for a number of years and performed with saxophonist Willie Akins and others, was the subject of a feature story on the website OpenSkyJazz.com. Rowe now resides in California, where he serves as executive director of the Brubeck Institute at University of the Pacific in Stockton, CA. * Bassist Chano Cruz is this year's recipient of the Richard McDonnell memorial scholarship from Jazz St. Louis. 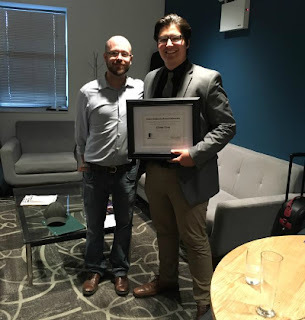 The scholarship is named for the late founder of MAXJAZZ Records, and was presented to Cruz last Sunday during the annual concert at Jazz at the Bistro raising money for the scholarship fund. Cruz (pictured, with his bass teacher Bob DeBoo) is from Saint Peters and will study jazz performance at Northern Illinois University. * Guitarist Dave Black has posted to YouTube a video of his original song "Night Traveler," recorded last Saturday during his concert at Focal Point. * Multi-instrumentalist Lamar Harris' shows this weekend paying tribute to George Clinton and Parliament/Funkedelic were previewed in a segment on KTVI/FOX 2's morning newscast on Tuesday. Harris will present the P-Funk tribute tonight and tomorrow night at Jazz at the Bistro. * Drummer and U City native Ronnie Burrage is taking time out from leading his own band to gig this weekend with saxophonists Gary Bartz and Rene McLean at Smoke Jazz & Supper Club in NYC, paying tribute to McLean's dad, the great alto saxophonist Jackie McLean.